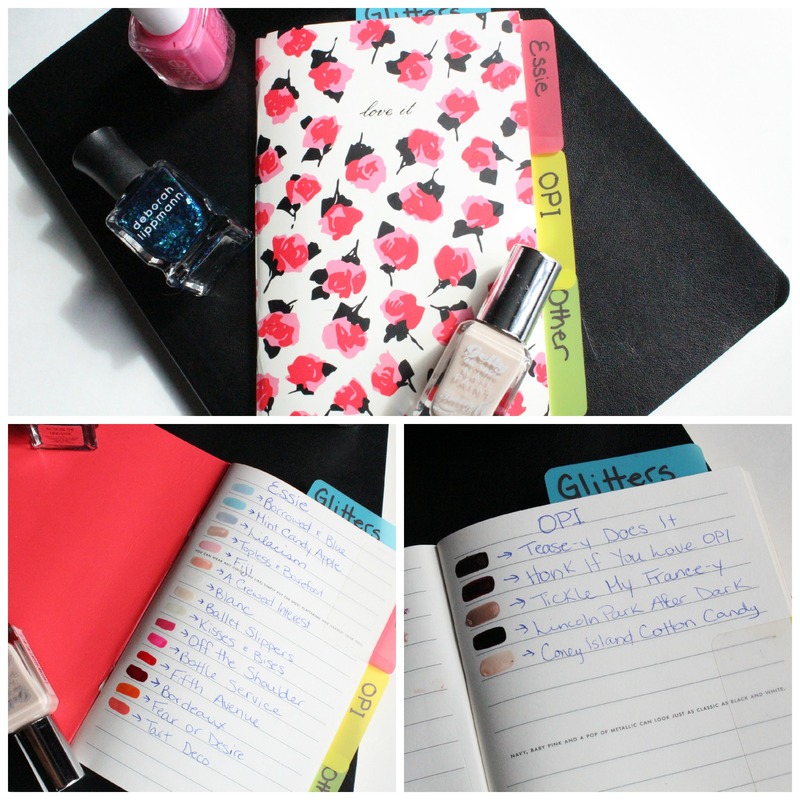 DIY Nail Polish Catalogue – amandarobots. I had some free time and a cute notebook I wasn’t doing anything else with, so I decided to create an organized flipbook of all my nail polish colours. I organized mine (primarily) by brand because that’s how I think of my colours in my head, but if you try this at home, you can organize yours however you like. – A cute notebook. Mine is a Kate Spade one that came in a packet of two. 1. 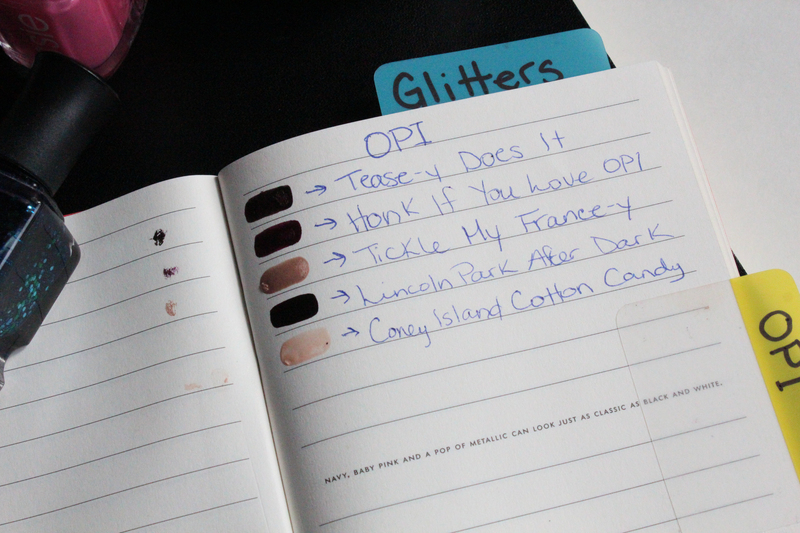 First, decide how you want to organize your polishes. By brand? By finish? By colour? Alphabetically? 2. 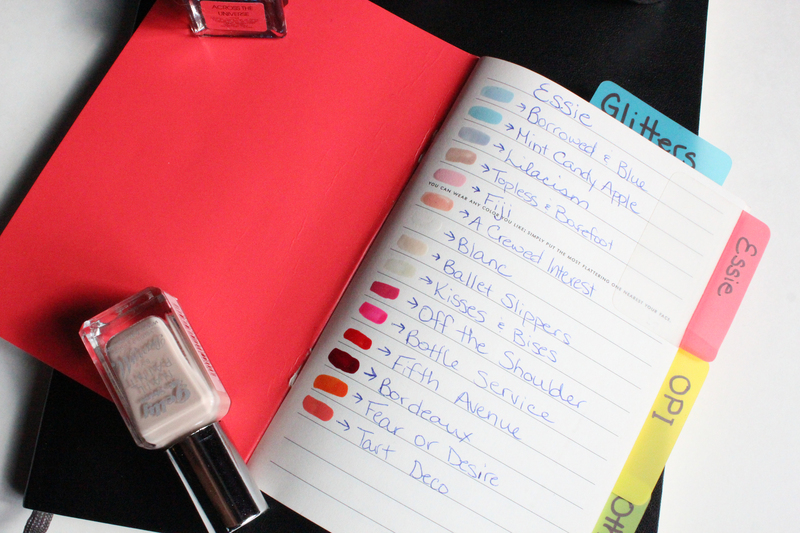 Next, start swatching and labelling your polishes. At this stage, it’s important to let each set of swatches completely dry before you turn the page. I got a little too eager a few times and ended up with polish transferred to the back of another page. It’s no big deal, but it’s less tidy. Also make sure you leave enough space (or additional pages) between sections to allow for your collection to grow. You can do this based on what shades or brands or finishes you’re drawn to. 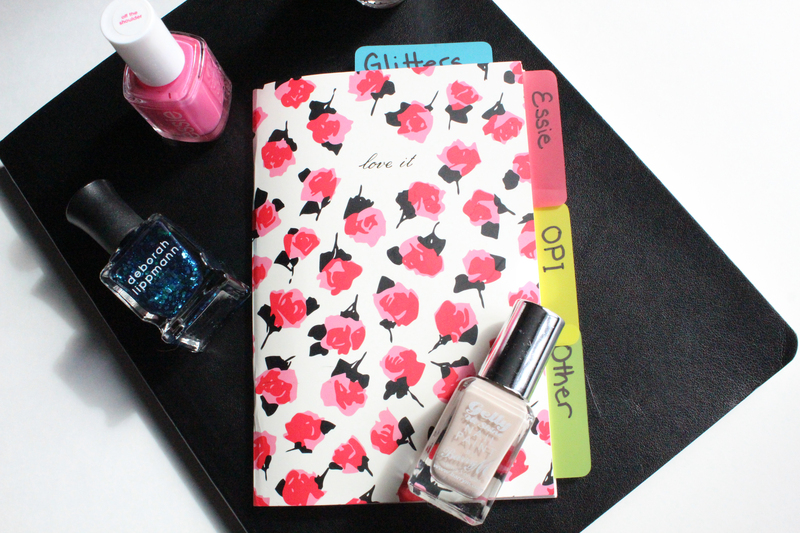 I, for example, really love Essie, so I left several pages at the end of the Essie section. I’m not so crazy about Butter London, so I left a half a page between the Butter London section and the section after it. 3. Label tabs for your sections so that everything is neatly organized and easily accessible. And voilà! Now you’ve got an inventory of all your shades to flip through the next time you’re a-paintin’. This is one of those ultra-simple ideas that are so brilliant, I want to smack myself upside the head and say, “Why didn’t I think of that? !” I organize mine by color on my shelves, but it would be nice to have a catalog to refer to instead of looking through little plastic baskets trying to decide what color will work.